Windows 10 automatically restart the PC whenever it installed updates that required a mandatory reboot in order to finish installed. User can no longer delay or postpone a restart indefinitely. The best a user can do is to schedule a time for Windows to automatically reboot, or since Windows 10 Anniversary Update, set an active hours which Windows definitely won’t restart the device. After installing updates that required a reboot to finish installing, Windows would normally ask user to restart. If the user does not restart the OS after a certain period of time, Windows 10 may start to show warning that operating system is going to restart at a specific time or after a certain duration of time. Eventually, Windows 10 will automatically restart, with or without user’s consent. Theoretically, Windows would only restart the computer automatically when user is not using the computer, but it’s not always the case. In fact, sometimes Windows 10 may wake up the computer to install the updates, and then auto-reboot. 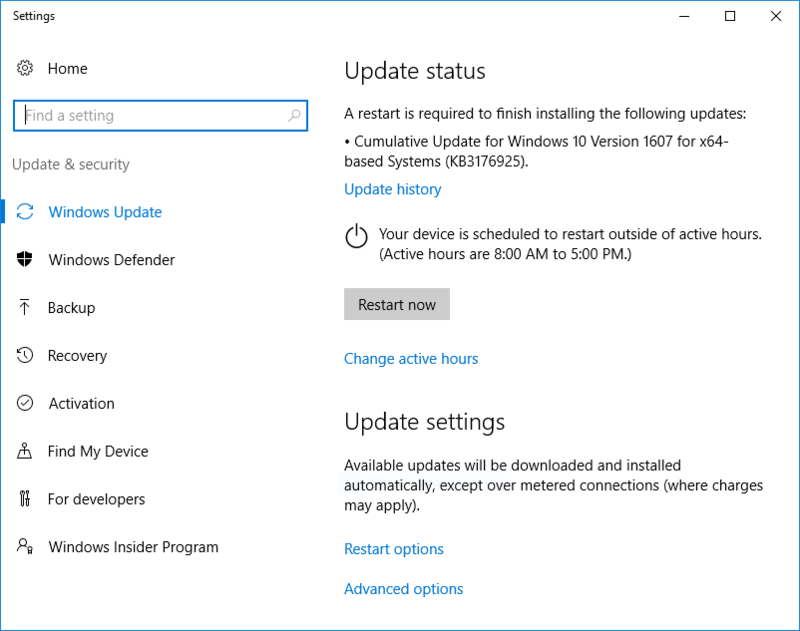 If you’re not fond of surprise or unpredictable Windows restart due to Windows Update, or face the situation when updates take a long time to install during the reboot, there are several steps that you can take to avoid automatic restart after installing updates. The following tutorials will guide you on how to prevent and stop Windows 10 from automatic restarting after updates are installed, permanently. Open Control Pane from Windows 10 Power Users Quick Access menu. Go to System and Security -> Administrative Tools. 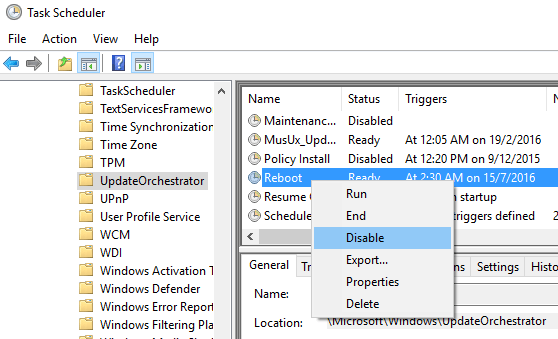 In Task Scheduler, expand the Task Scheduler tree to go to Task Scheduler Library -> Microsoft -> Windows -> UpdateOrchestrator. Right click on Reboot task, and Disable it. Right click on the Reboot file (without extension), and select Properties. Go to Security tab then hit Advanced button. Change the ownership to your own user account. Then, hit “Change permissions”, and disable the inheritance of permissions, and all permissions (i.e. 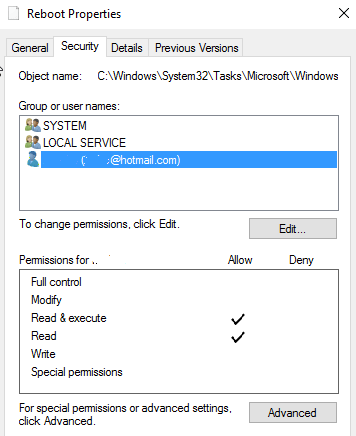 SYSTEM, LOCAL SERVICE and your user account) to read or read & execute only (ensure that no write, modify or full control permission is granted). This ensure of Windows OS cannot make any changes to the Reboot task. Alternatively, rename the Reboot file to another name, such as Reboot.bak (you may need to take ownership of the file). Then create a new folder and name it as “Reboot” to prevent the task with the same name been created again. There are several software utilities that can prevent, stop and abort the shutdown and restart process. There is a group policy which a user can set to disable the auto-restart, but YMMV as many people reported that Windows 10 ignores the policy when comes to mandatory reboot required for installing updates. Officially, the group policy applies only when Automatic Updates is configured to perform scheduled installations of updates. If the “Configure Automatic Updates” policy is disabled, this policy has no effect. 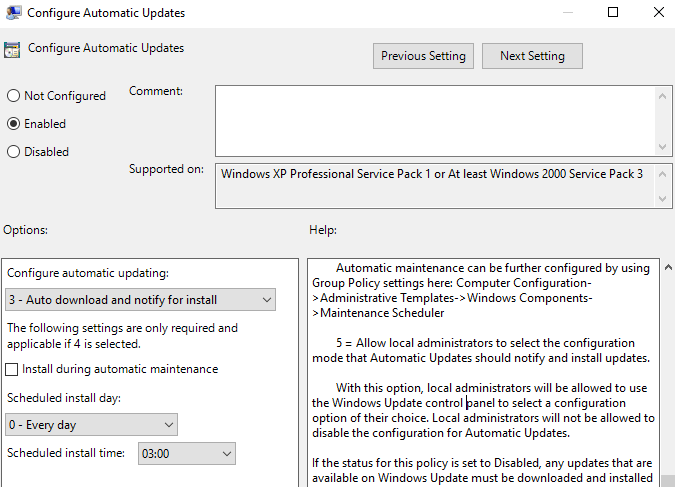 To configure the policy, open Local Group Policy Editor (GPEdit.msc), the navigate to Computer Configuration -> Administrative Templates -> Windows Components -> Windows Update. Set the status of No auto-restart with logged on users for scheduled automatic updates installations to Enabled so that Automatic Updates will not restart a computer automatically during a scheduled installation if a user is logged in to the computer. Instead, Automatic Updates will notify the user to restart the computer. Then, create a new DWORD (32-bit) value, and name it as NoAutoRebootWithLoggedOnUsers, then set its value as 1. Windows 10 needs to reboot because some updates require mandatory restart. If no updates are installed, then no automatic restart will be done. If the PC is connected only to Wi-Fi network, set the wireless connection as metered connection. 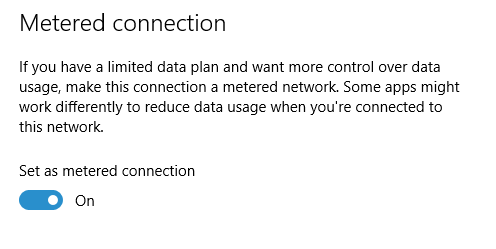 When a computer is connected to metered connection (normally used when tethering to phone connected to mobile 3G or 4G network with limited bandwidth cap), Windows 10 will not download and install the updates automatically. To set a Wi-Fi network as metered connection, open Settings app, go to Network & Internet -> Wi-Fi. Then, click or tap on Advanced options link (prior to Windows 10 Anniversary Update) or on the Wi-Fi network name itself (Windows 10 Anniversary Update or later). Toggle the Set as metered connection to On. Force the Windows Update to only download updates, but wait for user input to start installing (hence therefore reboot). To do so, open Local Group Policy Editor (GPEdit.msc), the navigate to Computer Configuration -> Administrative Templates -> Windows Components -> Windows Update. Double click Configure Automatic Updates and select Enabled. Then configure it to use either option 2 – Notify for download and notify for install or 3 – Auto download and notify for install. After applying the settings, Windows Update will wait for user to hit the “Install” button before installing any updates. Then, create a new DWORD (32-bit) value, and name it as AUOptions, then set its value as either 2 (Notify for download and notify for install) or 3 (Auto download and notify for install).